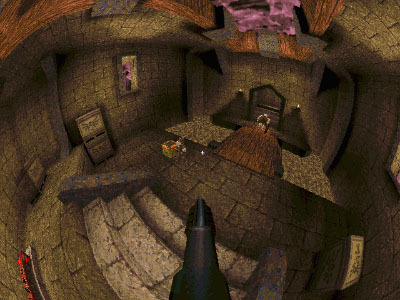 Fisheye Quake is a version of quake (software rendering) that allows you to play in ANY fov, i.e. 10 to 360 and over (the shots above are all in fov 180). Get the archive here (295k, win32, includes source). Warning: Fisheye Quake requires heavy computing power, and may induce motion sickness. The readme. More screenshots. This version of quake renders 6 views of exactly fov 90 in each direction, then uses a table to transform these pixels to a single view according to fisheye projection. I initially made this hack using the quake 1.01 source code for linux (illegally obtained), and later ported it to the GPL-ed win32 code released by id software. Shaun Williams recently made a video that does a very good job of explaining some of techniques behind Fisheye Quake. And his video & code/docs comparing many possible projection methods for Quake .